A consortium of Jetwing Hotels, MMBL - Pathfinder Group, Regency Teas and several others have invested Rs. 1 billion to open 'Jetwing Jaffna', a 55-room star class hotel changing the skyline of Jaffna. The project has also succeeded in providing employment for over 80 youths from Jaffna, who were provided with training in hospitality industry by Jetwing Hotels. Among the institutional investors is Leon Holdings, headed by a Sri Lankan expatriate hailing from Jaffna, who is a partner of a successful business venture in Europe. 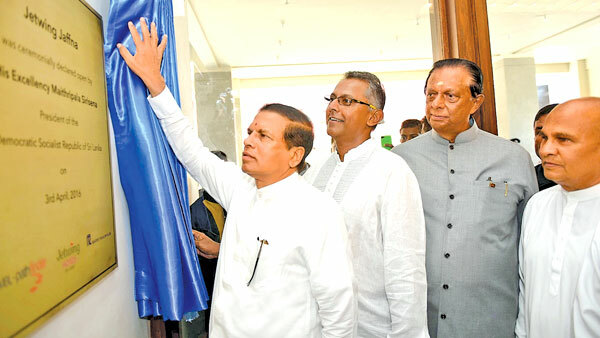 President Maithripala Sirisena who opened the facility said that the hotel project demonstrated the investor confidence on the Northern Province in general and Jaffna Peninsula in particular, as well as resilience of the people in the peninsula. Minister of Tourism Development and Christian Affairs John Amaratunga said that there were others interested in investing in Jaffna and that the Ministry of Tourism Development was planning to open a hotel school in the peninsula. Governor Reginald Cooray invited the Tamil Diaspora to return to Sri Lanka and make use of the investment opportunities in the Northern Province. Chairman Jetwing Hotels highlighted that it was a long and a difficult journey to realize the dream of having a Jetwing operated hotel in Jaffna. "Despite initial difficulties we faced, I was convinced that Jaffna was ready for a modern hotel and youth in the peninsula would be eager to choose hospitality industry as a career option," said Cooray. The land on which the hotel was constructed had been purchased in 1975 by late N. U. Jayawardena, the first Sri Lankan Governor of the Central Bank and entrepreneur, who realized the potential of Jaffna over 40 years ago! February 2012. It took 4 years for the project to come to fruition, overcoming numerous obstacles. The hotel, consisting of 8 floors and a basement, boasts of an air conditioned restaurant on its second level that could accommodate over 100 guests and a roof top sky lounge. Milinda Moragoda, and Founder of MMBL-Pathfinder group of companies along with several other Ministers attended the opening.